Way back in August 2012, I created some print at home water decals using a Mandelbrot Set. It was one of my favourite nail art creations that year. 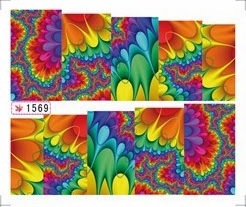 Imagine my surprise when I was browsing new products on the Born Pretty Store website and I spotted some water decals in another Mandelbrot set design. For 99c I just couldn't help myself and added them to my order. 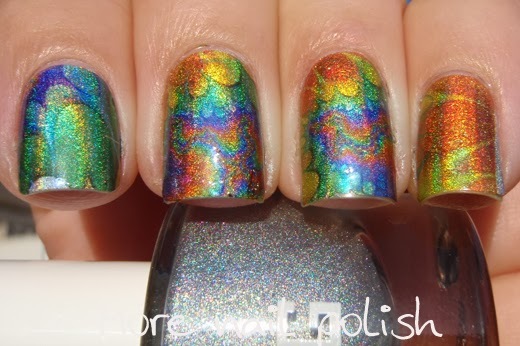 I decided to put the water decals over a silver holo so I could get a nice glowing holo flame behind the image. Although I'm sure if I layered it over white it would have shown the colours off to be a little brighter. This is what the water decals come like. They are in one sheet with seperate sections for each nail. To get a perfect fit for my nails, I like to trace around a set of stick on nails that I have set aside for just this purpose. By tracing around them, I'm able to get a perfectly neat and sharp finish to the cuticle edge of the water decal. I found these water decals easy to work with, and they weren't too thick or thin. But I did find they were too small for my nails. The largest one wasn't wide enough for my thumb, so I had to cut some of the excess length off and use that down the side of the nail. 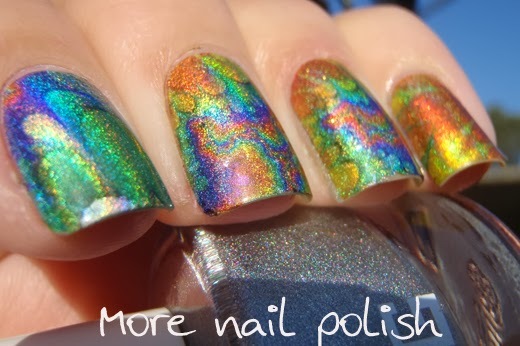 The one for my pinky nail was also too narrow, which meant I had a silver holo gap down the outside of my nail. What you can't see very well on either this photo or my picture, is that the water decals also have gold micro glitter highlights. 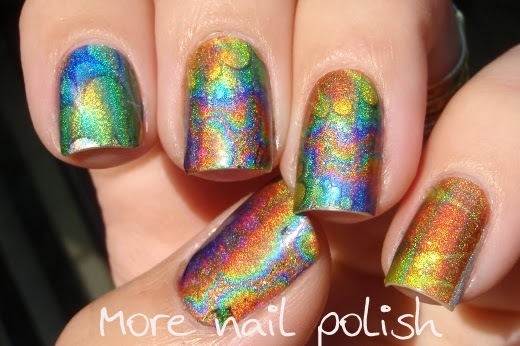 They get lost a bit in the holo finish, but would show nicely over a white base. 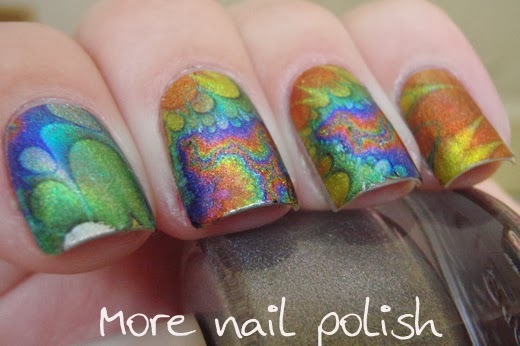 What I love about using mandelbrot sets in nail art is that they can look very much like multicoloured water marbling, minus the frustration and mess! These water decals are available from the Born Pretty Store for 99cents, they are item #11339 and this is design 1569. 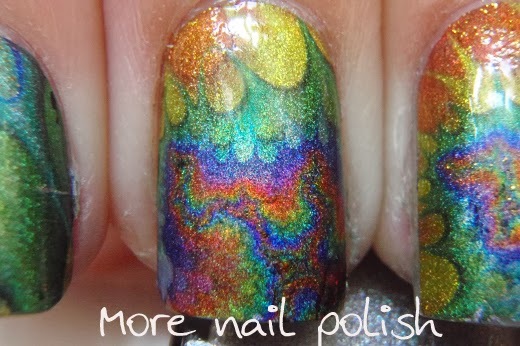 If you want to get some inspiration for nail art, check out this google image search for mandelbrot sets. I love this, it's so trippy! Brilliant! 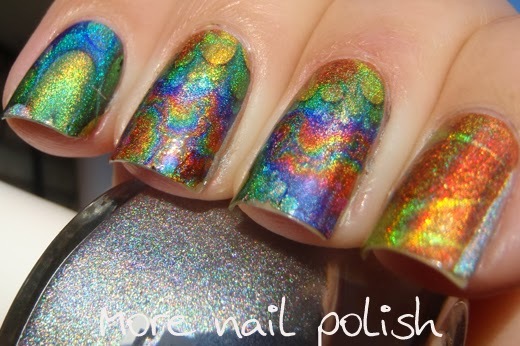 What a great idea - to put them on a silver holo! It makes the decals so much more beautiful and interesting.